Anyone who knows a little about Reiner Knizia’s games will know that the good Doctor loves games that deal with trying to get points in various different categories and then only score that category in which the player has the fewest. 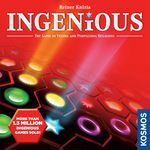 In the past, Knizia has used this mechanic to develop highly complicated games, but with Einfach Genial, he has distilled the mechanic down to its purest form. The game is played on a hex board. 120 equally sized pieces, each consisting of two joined hexes, come with the game. There are symbols on each hex that make up the piece – some pieces have two identical symbols, some have two different symbols (not unlike dominoes). The goal of the game is, through clever placement, to obtain points in the different symbol colors. Points are claimed by placing a piece such that the symbols on it lie next to already-placed pieces with the same symbol. The author of the game has also come up with solitaire and team play, in which two teams of two play with each player not being able to see his partner’s tiles.